Connect the device to the computer and click the Google account button in Addappter. Fill in the information about the customer. Click the Continue button and follow the instructions in Addappter. The device will start creating the account. On devices with Android 4.3 or earlier, you need to enter a captcha when creating an account. When the question is displayed on the device screen, enter the characters from the picture and click Next. 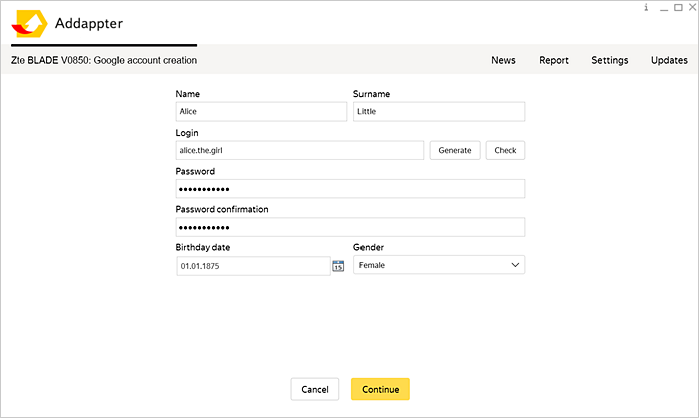 Addappter displays the username and password for the created account. Copy them and print them out for the customer. In Addappter, click the Back button.